Greenhouses just sparkle in July and August in the glare of the hot summer sun, and the landscape seems to radiate a yellow glow. Bathed in this golden embrace, the flowers of the great cattleya species, Cattleya dowiana hang like a yellow and burgundy necklace about the rays of the sun. Cattleya dowiana has sepals and petals ranging in color from mostly yellow to tan. The lips are almost always a velvety purple with golden veining. 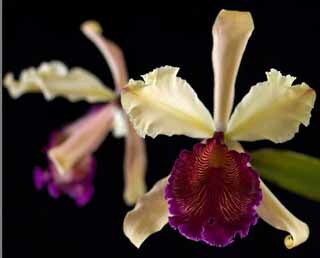 No cattleya has received more praise from orchid lovers over the years than Cattleya dowiana. Its arrival was announced 15 years before it actually came into cultivation and when it did appear, it blossomed into two species all at the same time. Despite its relatively short-lived flowers and the tendency of the plants to rot when over-watered in the winter time in a northern greenhouse, it has remained one of the most admired species of the genus. A lesser plant with these disadvantages would have disappeared from cultivation 100 years ago. An industrious young orchid hunter named Josef Warszewicz found the first Cattleya dowiana plants in the small Central American republic of Costa Rica about 1850. Warszewicz had come to a neighboring country, Guatemala, 5 years earlier to collect new tropical plants and seeds for a Belgian horticultural firm, Messrs Van Houtte – a job he apparently found too limiting. In 1846 he decided to go in business for himself, became an independent collector, and over the course of the next few years, literally filled the botanical gardens of Europe with plants, tubers, seeds and bulbs native to the Central American area. Many of the plants he collected were orchids and he traveled systematically through the countries south of Guatemala where he lived for months in Indian huts, subsisting on the local fare of maize and tropical fruits. Accompanied only by his Indian guide, he discovered C. dowiana in the mountain forests of Costa Rica and sent a group of plants back to England to Hugh Low & Co. He also prepared dried specimens of C. dowiana for Low to forward to his friend H. G. Reichenbach, a botanist in Germany, and asked Reichenbach to name the orchid for Mrs. Lawrence of Ealing who was one of the most liberal patrons of orchid collectors at the time. .
Cattleya dowiana should have been Warszewicz’ crowning achievement, but the Costa Rican plants arrived in England in such poor condition, they all died before producing a single flower. To make things worse, the dried specimens Low forwarded to Reichenbach were apparently lost en route, and Reichenbach had nothing to use to describe the new plant botanically. All that was left were Warszewicz’s written comments in his letters extolling the beauty of the flowers. These comments, however, created an excited interest in the new yellow-petal cattleya and it became the talk of horticultural circles in Europe. Like so many orchid hunters of his time, Warszewicz contracted yellow fever in Panama and in 1850 returned to Germany to recuperate. He was lucky he had not died from the disease because most white men did. His encounter with C. dowiana would haunt him so much during his recovery that when he was well enough, he left Europe and returned to the tropical cloud forests - this time in Colombia. He soon found his namesake Cattleya warscewiczii which Reichenbach described as a new species in 1854( Bonplandia 2:112) which immortalized Warszewicz name forever in the realm of cattleyas. What is surprising is that Warszewicz failed to discover C. dowiana in Colombia despite the fact that it grows together with C. warscewiczii in some areas. It is also interesting that Warszewicz did not return to Costa Rica to collect more plants of C. dowiana after he failed in his first attempt, but continued seeking new species of orchids in South America. It was inevitable, of course, that C. dowiana would be rediscovered in Costa Rica even without Warszewicz. Central America had become one of the most important areas for collecting new tropical plants in the mid 1800s after an English merchant, George Ure Skinner established a trading company in Guatemala in 1831. When the English botanist, James Bateman asked Skinner to collect some orchids for him to study, Skinner sent so many shipments of plants to Veitch’s Royal Exotic Nursery in Chelsea that Veitch had to build a new greenhouse just to handle them. One of Skinner’s shipments in 1865 contained a few C. dowiana plants but no mention was made of them in the shipping documents. When one of the plants flowered in Veitch’s greenhouse that fall it was a complete surprise to everyone. It was also a pleasant confirmation that what Warszewicz had said about the existence of a large-flowered yellow-petal cattleya species was true. James Bateman described most of the new species of orchids Skinner sent Veitch, so it was natural for Bateman to describe Cattleya dowiana as well. Skinner asked Bateman to name the new yellow-petal cattleya for a naval officer, Captain J. M. Dow of the American Packet Service “for the many kindnesses shown and the frequent assistance rendered to English naturalists and men of science who have been so fortunate as to come his way in their passage along the coasts of the Pacific.” In a twinkling, Warszewicz, Reichenbach, and Mrs. Lawrence were replaced by Skinner’s collector Arce, Bateman, and Captain Dow and the yellow-petal cattleya would be forever known as Cattleya dowiana. Two years after his triumph in delivering live plants of C. dowiana to the horticultural world of Europe, George Ure Skinner decided to retire and return to England. He went by way of Panama, and to his friend’s dismay, he ran into the same scourge as Warszewicz but with somewhat less success. On January 9, 1867, Skinner died from yellow fever. Warszewicz himself had a second bout with the disease, went back to Europe, and never returned to collecting orchids again. Death from yellow fever was also the reward for the next plant hunter who found Cattleya dowiana. In 1868, a German collector named Gustav Wallis discovered C. dowiana near Frontino, Colombia. Wallis was collecting for Jean Linden’s Belgian company L’Horticulture International and sent back a large shipment of plants to the delight of everyone. When the plants flowered in Linden ‘s greenhouses, Linden felt they had a brighter yellow color in the sepals and petals than the Costa Rican C. dowiana and some varieties lacked the lavender pigment in the petals and produced clear yellow-petal flowers. Linden was not accustomed to sharing success with other orchid firms and made it clear to the orchid world that his collector Gustav Wallis had discovered a new yellow-petal Cattleya species in Colombia. Linden did his best to convince his customers these plants were not Veitch’s Cattleya dowiana. As a new species, the plants commanded a higher price, so Linden praised the brighter yellow color of the flowers and renamed the species “Cattleya aurea.” Botanical authorities rejected Linden’s claims that his C. aurea was a new species. Even Linden’s good friend, Reichenbach refused to describe it as such and Linden in desperation wrote a botanical description himself in his own scientific publication,L’illistration Horticole (30: 125). Linden also presented his Cattleya aurea to the horticultural world through the magnificent full-color lithographs of his beautiful book Lindenia, and the acceptance of the name Cattleya aurea is a testament to the importance of Linden’s company and Linden’s personal influence during this period. By the late 1800s, Cattleya dowiana had become two species – one residing in Costa Rica and one 600 miles south in Colombia and the species has unfortunately drifted in and out of its two-species personality ever since. Linden himself eventually began calling his Colombian Cattleya aurea by the generally accepted name, Cattleya dowiana. He was basically a practical man and when there was no commercial advantage to separating the Costa Rican and Colombian types into separate species, he called them Cattleya dowiana as everyone else. It was difficult to do otherwise when, after 30 years of growing thousands of them, commercial growers could see no real difference between the Costa Rican and Colombian yellow cattleyas in the size of the plants, their growth habits, rooting habits, flowering season, flower shape, flower size, number of flowers on a stem, vigorousness, fragrance and intensification of purple color in hybridizing. Certainly the vast majority of horticultural and botanical authorities today favor the name C. dowiana for both the Colombian and Costa Rican plants and the International Authority for the Registration of Orchid Hybrids feels the same way. The Authority does not recognize Cattleya aurea as a species and will not register a hybrid using it as a parent. Sander’s List of Orchid Hybrids therefore shows no crosses using Cattleya aurea even though yellow Colombian cattleyas have been used in breeding many of the hybrids shown. There is some difference in color between the plants that grow in Costa Rica and those that grow in Colombia which is not surprising considering their wide separation. The brightest yellow varieties come from Colombia, including most of the clear yellow-petal types, and those with an abundance of yellow in the lips. By contrast, the plants from Costa Rica tend to have more lavender in their yellow sepals and petals. The famous ‘Rosita’ clone (FCC/RHS 1901) from Costa Rica had petals that were mostly purple, and selfings of it produced some red-purple forms. While each area produces its own distinctive blend of colors, the things that bind Colombia and Costa Rica together are the plants that come from both areas that look exactly alike. They have yellow sepals and petals with some purple in them and it is impossible to tell them apart. The typical Cattleya dowiana has flowers with pale yellow sepals and petals with some purple or lavender blended into them and a lip that is intensely dark purple with fine gold veining. The flowers are fairly large ranging from 5 ½ to 8 inches across. James Bateman originally described Cattleya dowiana in 1866 as having sepals and petals of a “mellow straw color,” but there are flowers with petals that range from red-purple to tan, yellow suffused with lavender, pale greenish-yellow, golden yellow and even orange yellow. The lips of C. dowiana vary from dark crimson-purple with and without gold veining to crimson with large yellow eyes, to lips that are virtually all yellow sometimes beautifully edged in pale lavender. One of C. dowiana’s most unusual characteristics is the variability of the yellow color in the lip. One year the lip may have only a small amount of yellow or no yellow at all, and the next year that same plant may produce a lip that is almost all yellow. The amount of yellow can even vary from flower to flower on the same inflorescence as can be seen in the Cattleya dowiana aurea‘Kathleen’ AM/AOS pictured in this article. This variability in yellow color even appears in the old lithographs of the 1800s. One of the most famous yellow-lip Cattleya dowiana is the clone ‘Statteriana’ which Linden featured in Plate 356 of Lindenia. In Lindenia it had an almost completely bright yellow lip. The Orchid Album also published a picture of ‘Statteriana’ in Plate 468 which shows a lip with only two enlarged yellow eyes with most of the lip being dark purple. Cattleya dowiana normally produces 4 or 5 flowers on a flower stem and, because of its beautifully colored flowers, large size and this floriferousness, C. dowiana has been used in breeding more than any other large-flowered Cattleya species. It has the unique quality of darkening and enriching the lavender color of other cattleyas when bred with them and it is responsible for the intense dark color of many of our best lavender hybrids today. This darkening effect occurs when either the Costa Rican or Colombian type is used although the degree of intensity varies with the clone. Cattleya dowiana is one of the most beautiful of all the Cattleyaspecies and many writers have even called it “the most beautiful.” In addition to its magnificent colors, its flowers have a wonderful fragrance that fills every corner of your greenhouse or home. H. G. Reichenbach, who described some of the finest of the large-flowered Cattleya species, complained in his later years that he should have been the botanist to describe Cattleya dowiana, not James Bateman. He felt it was one of the great disappointments of his life, and Reichenbach’s loss says a lot about C. dowiana’s place in the hierarchy of the large-flowered Cattleya species in the minds of the horticulturists and botanists of the 1800s. 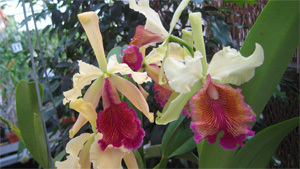 It tells us Cattleya dowiana was the most prized of all the species. Cattleya dowiana is a strong, vigorously growing plant that produces a tall 4 or 5 flowered bloom spike in mid-summer in the United States. It will begin sending out a new growth in late winter or early spring and flower buds will emerge from the sheath before the growth is fully mature in July or August. The flowers unfortunately are not long-lived and two weeks is about all you can expect from most varieties under hot summer conditions. The short life of the flowers undoubtedly accounts for its strong fragrance since it must attract its pollinators as soon as possible before its flowers die. Cattleya dowiana likes a warmer temperature than most other large-flowered Cattleya species, with a minimum of 65F at night. It should be kept as dry as possible when it is dormant from September to March to avoid developing root and pseudobulb rot that can kill the plant. Like Cattleya warscewiczii, C. dowiana likes lots of sun and its leaves should be a light green color it you want plenty of blooms. C. dowiana also likes lots of moving air to keep it healthy. Although it requires very little water when it is resting during the winter, it likes a good supply of water when it is actively growing.